Here is another design I created using the nail tattoos I received from Fake Tattoos. All these images are from the bird design. I created a simple blue gradient with a white base and OPI No room for the Blues. I got the darker shade by blending a little black polish with the OPI and the lighter shade by blending a little white. I found placement a little tricky with these, because when the paper is face down you can't clearly see the angle of the design on your nails. This mean I had to create my black french tip a little uneven on each nail to cover the gap, otherwise some birds would be just sitting there in mid air. 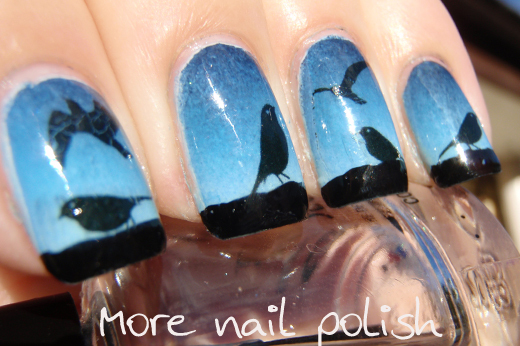 I know a couple of girls that would be totally freaked out by these nails, complete ornithophobics! Oh these look so cool!!!! 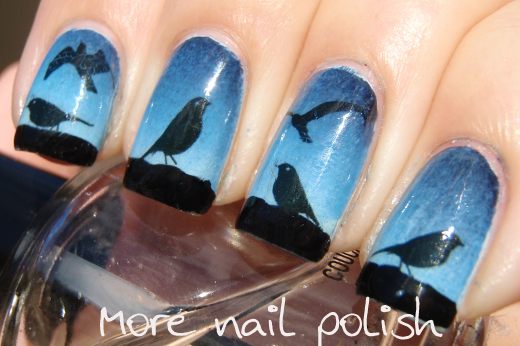 I LOVE birds! 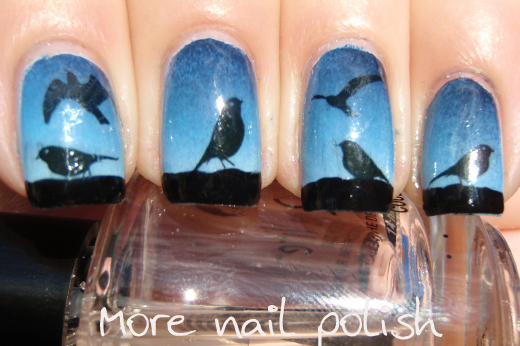 I love your mani!